Step 2 • if step one is successful, then dial *688*1# immediately and you will receive 1gig of free data from Airtel. Continue to dail *688*1# to accumulate the data. "Welcome to SMARTTRYBE JR! 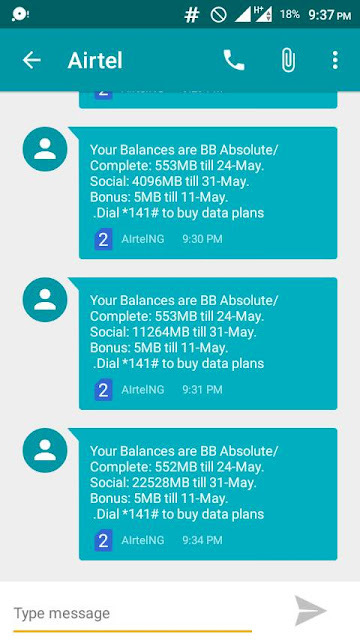 Please fail *317*2*number*1# or send "PARENT" 080xxxxxxxx" to 317 to register your parent line & enjoy bonus on your parent's recharge!" If you get an error message just keep dailing the codes until you get the success message above. If you remembered the Airtel N200 for 20GB free data that was blocked sometime ago, you can use the same method to download large files on opera mini...with your free Airtel data you've accumulated. Hurry while this free browsing 2017 Airtel awoof lasts! Dont forget to drop your comment below. How do i use to browse using psiphon? Only opera mini? What of UC or chrome? How do you download with it? the data has been wiped by Airtel. Nairabit app nor longer working. what's the way forward please? It's saying application down, what can I do??? ?